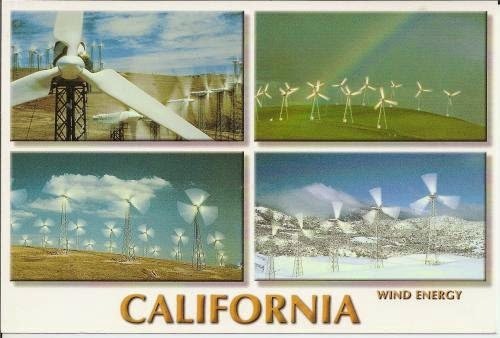 Postcard US-2822274 from California is a multi-view card that shows wind farms in California. The description on the card reads "California contains the world's largest concentration of wind turbines. Every year the 15,000 wind turbines in the Altamont, Tehachapi, and San Gorgonio Passes produce enough electricity to meet the residential needs of a city the size of San Francisco. And they do so without producing any air pollution or contributing to global warming. California's use of wind energy has become a model for counties around the world." Photo credits by Lloyd Herziger and Ed Linton.